Website forms are critical to enquiry driven business (particularly B2B) and yet they are often the most overlooked... literally allowing customers ready to enquire just walk away! Not having an optimal form design is disaster. Imagine for a minute you have just delivered a sensational sales pitch. You've trained for this moment. You delivered the perfect speech. The customer is basically reaching for his cheque book... then you promptly walk out of the room never asking for the sale. Some clients will chase you down the hall, most will let you go. This is what you are doing if you haven't thought about your form design. Don't leave without asking for the sale properly! OK spoiler, there is no one-size-fits-all optimal form design. Like most things in marketing, you have to adapt it to suit your audience. There are however best practices. Implement these and you will see your enquiry rate skyrocket. The most effective element of any form, is telling people what they receive if they enquire. For example, saying "enquire now" creates more questions than answers. A better alternative is "Enquire for a free loan application analysis". This second title provides so much more context. As a result consumers feel better filling it in. Likewise, reducing friction is another important step in form creation. 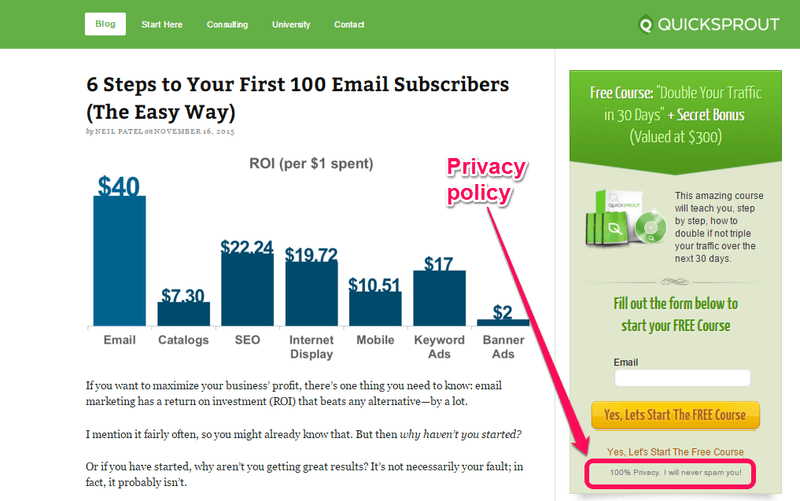 In the below example from Neil Patel, we see a form with a brilliant headline, and a friction reducing guarantee not to SPAM. You might notice he also only has a single form field... clever. Less form fields is better... right? This common belief is mostly true, but not always. Generally speaking, removing form fields will increase conversion rate. Although, there are exceptions to the rule. Particularly when you make it clearer what the customer will receive in return. 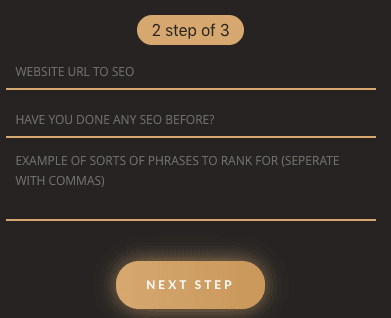 In this example from ConversionXL, the form with more options increased conversion rate by 33.1% despite being considerably longer. The reason, customers had more context, and hence were more comfortable handing over their personal details. The other often overlooked element of optimal form design is quantity v quality. Whilst hacking away at form fields is great for reducing friction, it also opens the flood gates to low quality time wasters. Our Caribbean photography client Ceci Dumas tested this recently, removing the phone number field from her forms. The result saw a stampede of enquiries, and an incredibly low email response rate (poor quality). In contrast, when reapplying the phone field, the sales rate shot up drastically. She generated many more sales, from much less frustration. Long cumbersome forms are highly demotivating. It's no surprise to us when we audit customers and see a big form and a low conversion rate. It's like waiting in line at the bank, who has the time? A great solution to this is a multi-stage form. Provide the soft questions first, before building the complexity. Clearly sign post how stages in the form and hook them with the 'well I've come this far' sense of FOMO. The below example is our own $1 Trial SEO Deal. Whilst there are not a lot of form fields to begin with, we receive much higher quality enquires than we use to. The reason is again the 'I've come this far' mentality. Once you have started a process, you've come too far to go back. If they do back-out, we already have their contact details captured for followup. 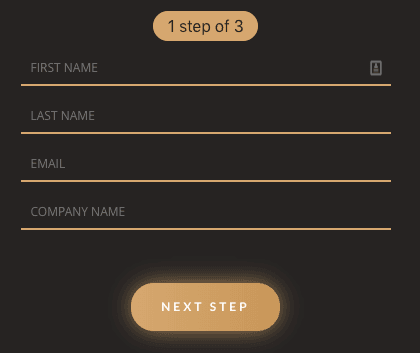 Multi-stage forms work great for B2B clients. They often need quite detailed information, or wish to ask qualifying questions along the way. 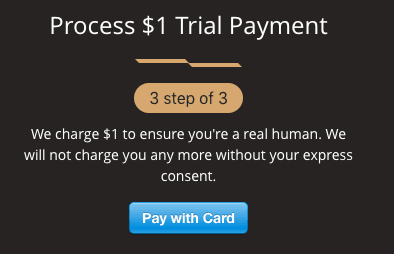 The final step requires $1 payment... easy! Clearly option #2 provides a lot more context, and hence it's a much more attractive proposition. Moreover, if you are someone that doesn't have $1000, then we probably didn't want your enquiry in the first place. So the enquiries you do receive will be people ready to act now! In a previous article we wrote about how to write headlines that convert. The tools we recommended are all free, and available for use online. Check it out and start improving the effectiveness of your forms! At JMarketing we believe no company should be advertising if they don't have the conversion optimisation basics implemented already. To discuss how you can improve your conversion rate, send us a message and ask for a free assessment of your website.